Thin slice the beef against the grain. Marinade the beef in the soy or fish sauce, sugar, and salt for at least a half hour. In a food processor, make a paste with the ginger, garlic, shallot, and spices. Dice peppers, onions, and bamboo to desired size. Get a thin layer of oil in a pan and heat it up. Fry HALF of the basil leaves in batches until the leaves are crisp, and set aside on a paper towel. Put beef and marinade into the hot oil used to fry the basil, and cook until starting to brown. Add the ginger garlic paste and peppers and onions. Saute for a few minutes. Add the bamboo and coconut milk. If it is looking a little light, add some chile powder to redden it. Cook 10 or so minutes. Add the other half of the basil. Remove from heat. 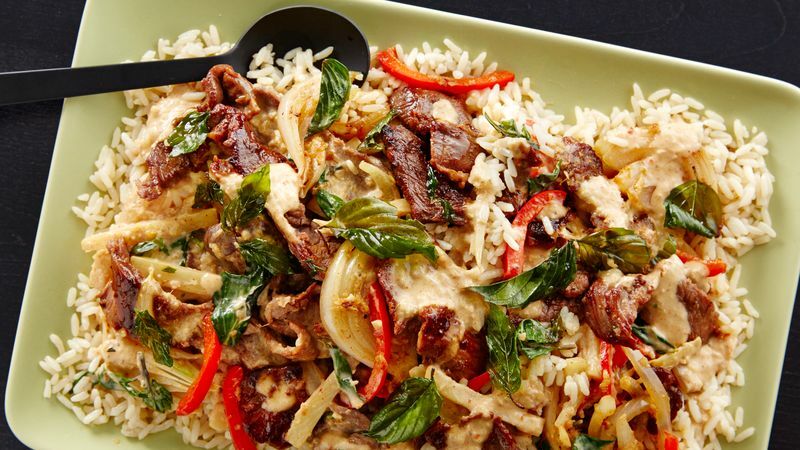 Serve with jasmine rice, and the crispy basil. Chile Basil Beef was the first Thai meal I ever had. I think chile basil is the first Thai meal lots of people eat, because looking at a Thai menu for the first time is a little intimidating! Panang, whats that? Red curry? I thought curry was Indian? Tom Yum? Chile basil, ahhhh now THAT sounds familiar! I will always remember that first time trying this meal. It was the first time I had basil in a non-Italian way, and it really opened my eyes! Every time I make it, it reminds me of that first time. Thai basil and fish sauce are a bit more authentic, but feel free to swap it out for soy sauce and sweet basil. The detailed Chile Basil Beef recipe can be seen here, but there are some photos of the process below. These ingredients go into a flavorful paste that makes up the base flavors of the dish. Be sure to slice the beef thin and against the grain. To make it easier, you can put it into the freezer for a half hour before slicing. This beef marinades in the soy or fish sauce, and a bit sugar and salt for about a half hour. All the ingredients ready to go into the pan. The first step is to fry the basil leaves. This gives the oil a nice basil flavor, and also makes crispy basil to garnish the dish with! Beef in first, followed by the peppers, onions, and paste. Everything simmering with coconut oil. The crisp basil finishes it off.